John @Racener removed his name from the list of the best players without a WSOP bracelet. It was a long road for John Racener to win his first bracelet, and it took him a full day of play to finally get to the top of that mountain. Racener started as the chip leader on Day 3 of the $10,000 Dealer's Choice 6-Handed Championship, but he was all over the map. At one point he slipped to the bottom of the chip counts, then bounced right back up to the top. Then, after Mike Matusow was eliminated from the tournament in fifth place, it seemed like Racener just won every pot. He eliminated the last three players in very quick fashion to lock up the win, the $273,962 prize, and his very first World Series of Poker bracelet. It wasn't the Racener show all day though. Dropping early were Shawn Buchanan and Ben Yu. Buchanan dropped to Viacheslav Zhukov in a hand of Badeucey, while Yu was eliminated by Matusow in a hand of Stud Hi-Lo Eight or Better. James Obst took a couple successive beats, opted to change the game to No-Limit Hold’em and was drawn out by Matusow when his fell behind to Matusow’s on the river. This brought the final seven players to the unofficial final table where Racener held a slight chip lead. It was Eric Crain who fell first at the unofficial final table when Matusow completed a nine Badugi and ninety-five low to Crain’s ninety-seven low in Badacey. The final six players played for roughly an hour and a half before Schuyler Thornton fell on the short stack and was eliminated in a hand of Badacey as well. Matusow and Racener split up his chips with a Badugi and an eighty-seven low respectively and he hit the rail. The final five players then reached a stalemate, with players doubling up, dropping chips, trading the chip lead over and over again for over five hours. It was Matusow who would fall first though. He ran into the wheel of Zhukov during a hand of A-5 Triple Draw. Racener then eliminated the final three players in a span of less than ten hands to close out the tournament. First was Dennis Eichhorn, who couldn’t catch up to Racner’s eighty-six low in a hand of Pot-Limit 2-7 Lowball. With that hand Racener took the massive chip lead, with over a million more than the next player at the table. He opted to change the game to No-Limit Hold’em and ended the tournament in three hands. Chris Klodnicki shoved all in with the and Racener called him down with the and held through. On the last hand, Zhukov moved all in with pocket sevens, but couldn’t win a race against Racener’s . Racener flopped Zhukov to just one out and he did not catch it. 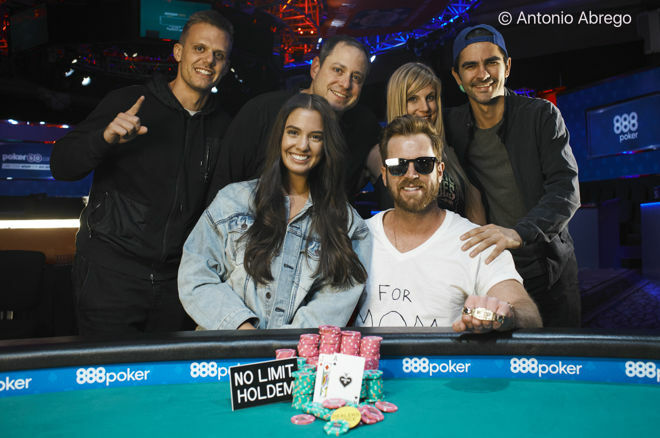 With that, Racener locked up his very first bracelet, more than six years after his November Nine run and second-place finish in the Main Event. He took home $273,962 for this victory, but more importantly, the sense of accomplishment that goes along with it. For him that was what was most important. 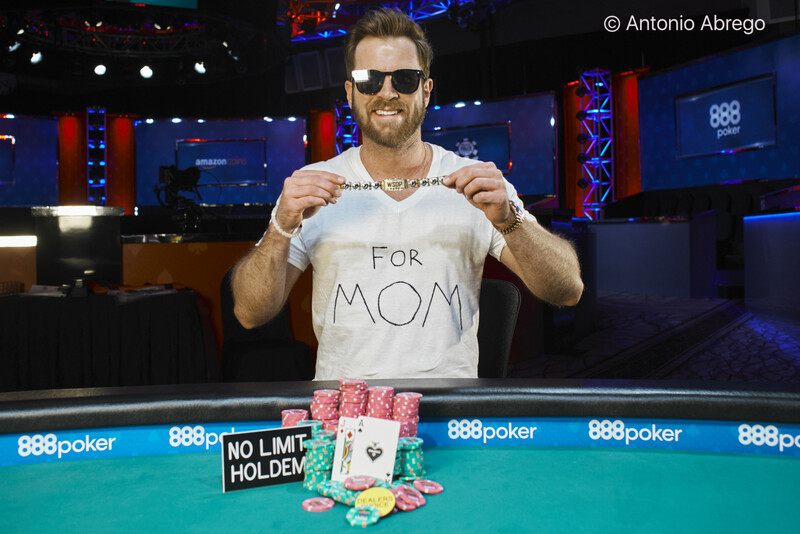 For Racener, taking the bracelet home for his mother was what he wanted the most. "She passed away about three-four years ago and I've been wanting to do it and I never did it. I said you know what I'm going to man up, I'm going to balls up, and I'm going to do it this year and boom. First time I wore the t-shirt, I won. She's my biggest fan, still is, and she is happy as hell right now. So is my Dad up there."